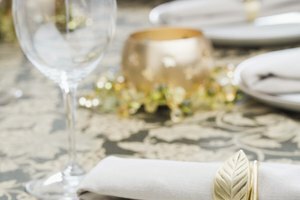 The rules of formal table etiquette can seem complicated and overwhelming. Bear in mind that the subtle rules of dining are not just an exercise in frustration. Etiquette rules that specify the arrangement and usage of knives, forks and spoons have evolved, along with the utensils themselves. Initially, these rules were intended to prevent the utensils from being dangerous or threatening. Today, practicing appropriate table etiquette demonstrates your social skills and indicates respect for your guests and fellow diners. 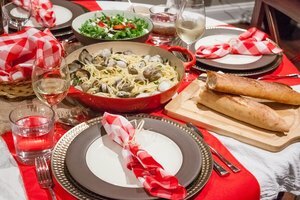 For formal, multicourse dinners, you may find as many as eight utensils at your place setting. 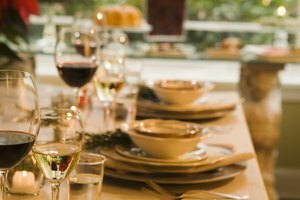 The manner in which you arrange your utensils will subtly tell the server when you have finished each course, so that your dishes and utensils can be cleared. 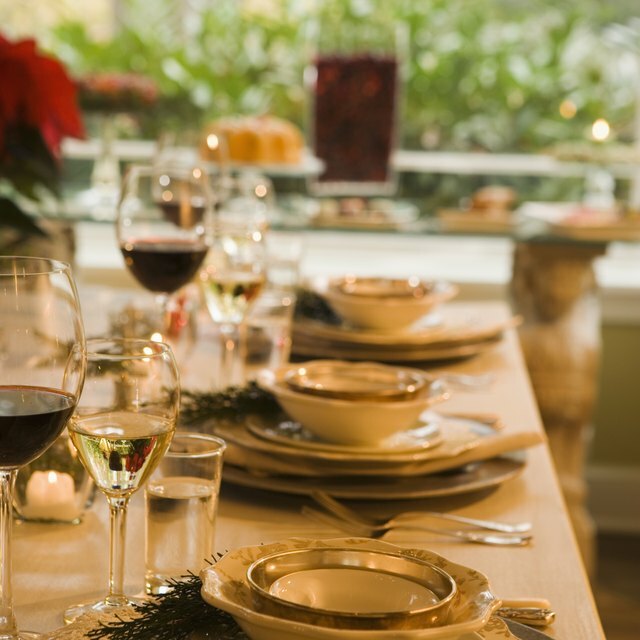 By remembering a few simple rules, you will be more confident during your next formal dinner. Use utensils. 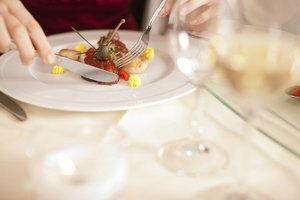 Though some foods may be easier to eat with your fingers, it's best to eat with utensils in formal settings. The general rule is that any food served on a plate must be eaten with utensils. Do not rest used utensils on the table. Once used, utensils should not touch the table again. Courses served in a bowl will usually be presented on a service plate. Rest utensils on the service plate if one is provided. If there is no service plate provided, rest utensils in the bowl. Do not pick up a utensil from the floor. Ask the server for a new utensil before you continue eating. Lift your utensils to eating position to prevent the server from removing your food before you've finished the course. Try to be considerate of other diners. If everyone else has finished, rest your utensils and leave any uneaten food. Arrange silverware on your plate while pausing for conversation. The fork share should be placed on the right and the knife on the left, crossing over the center of the plate. Place your butter knife at the top of the bread plate, with the blade facing toward you. Rest soup and dessert spoons in the bowl between bites. Set the fork and knife on the right side of your plate while waiting to be served a second helping. Signal that you have finished the course by resting you knife and fork on the plate parallel to each other, with the handles pointing to five o'clock and the ends pointing to 10 o'clock. Arrange your knife on the plate with the cutting edge facing toward you. Set your fork with the tines pointing down. Leave the soup or dessert spoon on the service plate. Place your hands in your lap once your silverware has been properly arranged. Do not rest your hands or elbows on the table. Eat dessert with either the spoon or fork or both. When you've finished, place the utensils on the service plate. Leave any unused utensils in their original positions on the table. 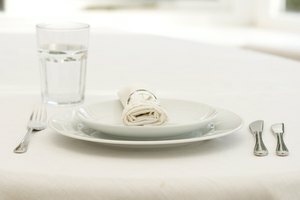 Set your napkin neatly at the left side of your place setting. (It should not be folded, crumpled or twisted.) Do not leave the napkin on your plate or on your chair. Use a new utensil for each course, starting from the outside and working toward the plate. When in doubt, watch your hosts and fellow diners for cues. If you accidentally use or position your utensils improperly, make the correction without attracting attention. Never acknowledge other diners' etiquette mistakes. Don't forget to enjoy yourself! Madison, Lane. "How to Place Utensils When Finished Eating." 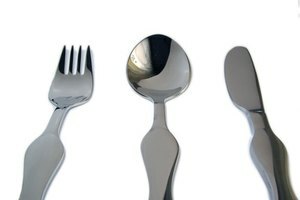 Synonym, https://classroom.synonym.com/how-to-place-utensils-when-finished-eating-12079760.html. 29 September 2017.